Nadav Kander is a London-based photographer who focuses on photographing interesting landscapes. 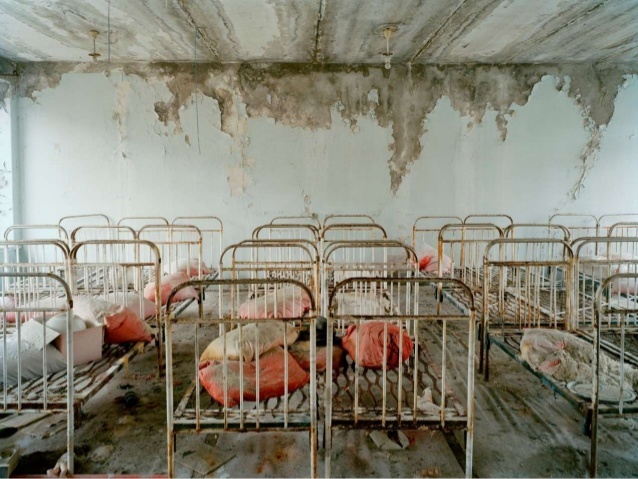 In his series 'Half-life', he explored the forgotten town of Chernobyl. In 1986, one of the reactors in the nuclear power plant exploded, expelling lethal amounts of radiation. Everyone in an 18 mile radius had to immediately leave their homes and all their belongings. Kander goes back and visits the town which has just been left to decay (as it's uninhabitable) and photographed various places of interest. It's interesting to see the extent to which the setting has deteriorated and that nature has taken over. Keywords: decaying, desaturated, rusting, organised, forgotten. Mise en Scene: This image consists of rows of metal bed frames, in pairs in three 'columns'. The back wall is a desaturated blue which is peeling an greying. Process: Kander used a 5x4 film camera. Content: The photographer intended to portray the isolation and abandonment of the orphanage and town. He did this by including the empty, bare bed frames and highlighting them by making them take up most of the frame. The deterioration is enhanced by the peeling paint on the back wall and the rusting bed frames. It evokes a mood of sadness (maybe due to the melancholy colours) and emptiness. This is partially due to the lack of people in the image, with the implication that humans have been here many years before. The composition of the image portrays order and uniformity despite the juxtaposed deterioration of the subject matter. Keywords: overgrown, wild, deteriorated, faded, aged. 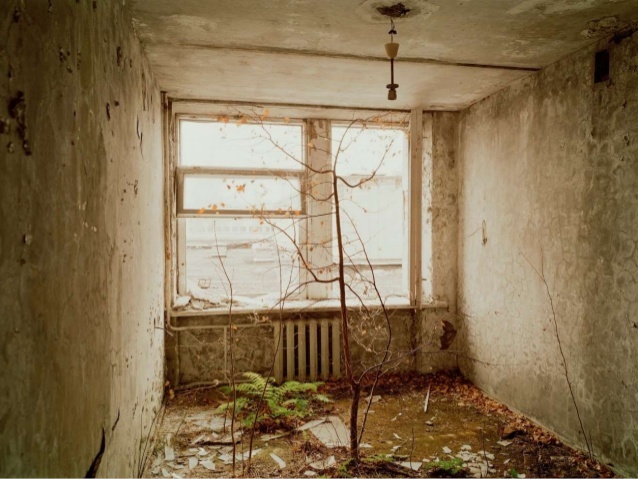 Mise en Scene: This photo depicts a bare, small and decaying room. There are windows on the far wall and a light fixture hanging from the ceiling. There is a leafless tree growing in the middle of the room. Content: The photographer intended to show the extent to which nature has overtaken man-made structures, specifically in the town he visited. 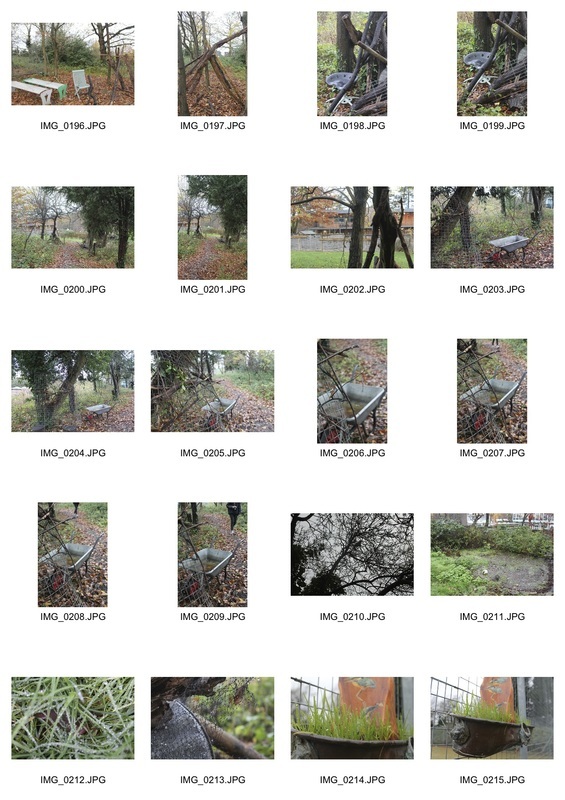 He did this by showing the tree and other plants and composing the image so that they are a focal point. He has also angled the camera so through the doorway. This implies that the viewer is merely an onlooker and has no real impact in nature taking it's course. This is effective as it adds to the idea that humans (now) have been shunned in favour of plants, and that nature has reclaimed Chernobyl. Keywords: abandoned, dust, coated, preserved. 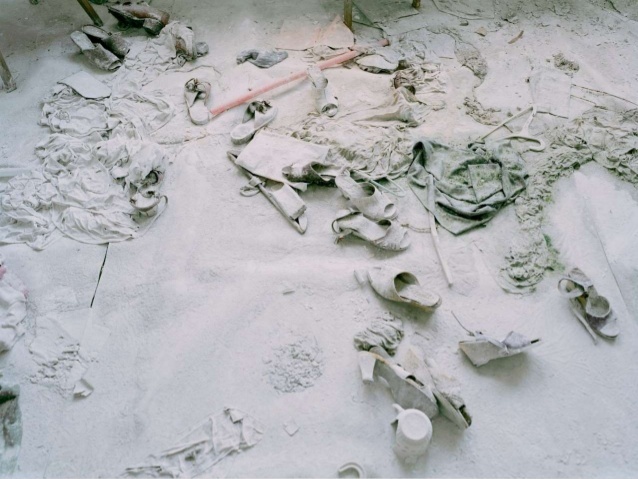 Mise en Scene: this image shows various possessions (shoes, clothes etc) all covered in a thick layer of white dust/ash. The only predominant other colour is a splash of orange from an old hockey stick. Content: the photographer intended to show the rush in which people had to leave Chernobyl after the accident. This is done by depicting the various personal possessions that have had to have been left, with no time for them to be packed before the evacuation. The thick layer of untouched ash shows that they've been left for many years, without anyone being able to collect them. 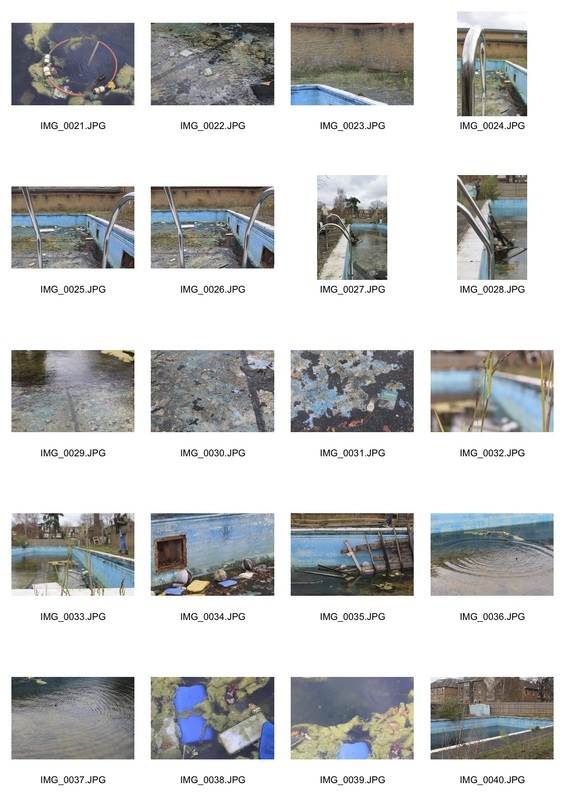 Responding to Kander's work, we visited the abandoned swimming pool in our school. I tried to capture the desaturated blues and focus on texture, lines and colour. I also tried to capture the same sense of lonliness and stillness that Kander did in his 'Half-life' series. I then edited my favourites by desaturating the whole image, or certain parts. This made them feel colder and more dated- like the pool. I chose to compare these two images (Kander's on the left and my response on the right) because I think there are overlapping elements in both. 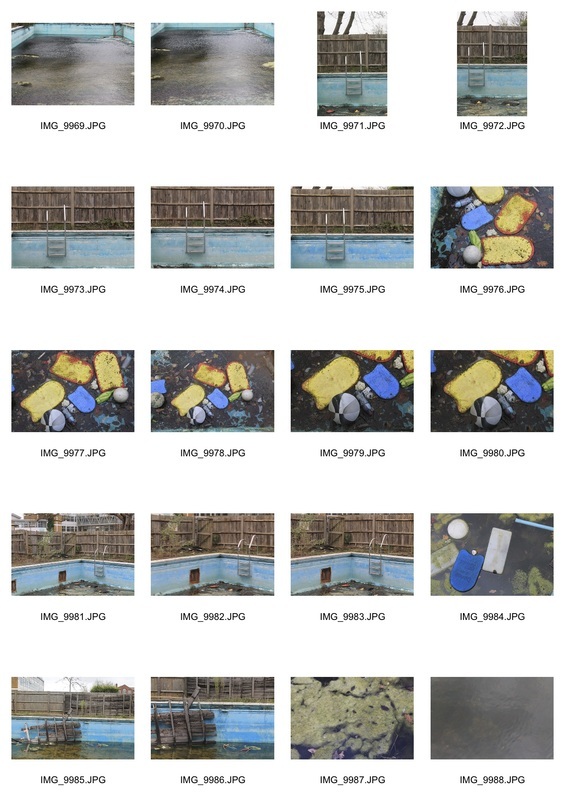 For example, in Kander's image of the abandoned gym there are pieces of rope hanging from the ceiling and littered across the floor, which can also be seen in my image of the pool where a rope coils around on the floor before hanging in to the water. 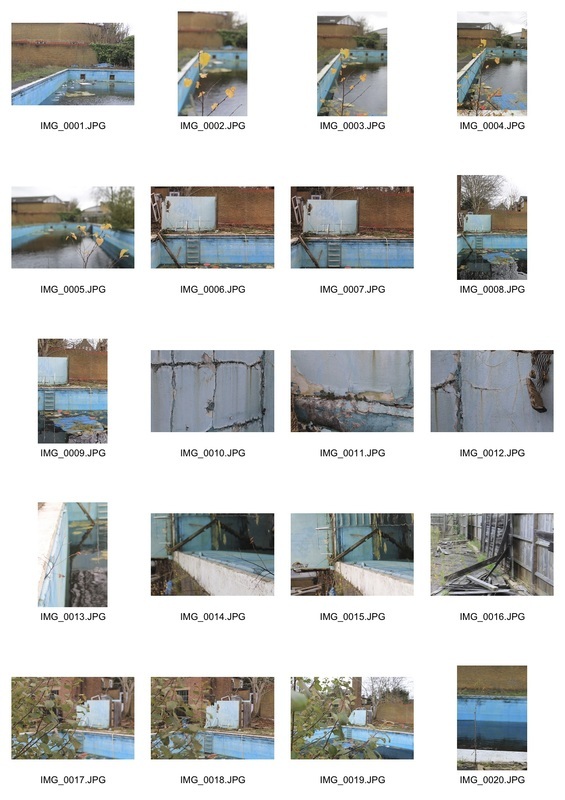 Also, the desaturated blue colour can be found in both images, and it's peeling/decaying texture adds to the sense of abandonment (although in Kander's the blue is considerably more faint). 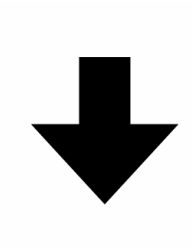 The warmer, brown colour can also be seen in both images. Another similar element is the recurring theme of nature taking over: this is seen in Kander's image through the tree growing, and in my response via the algae in the water and weeds growing through the cracked concrete. However, Nadav Kander's image has much greater depth and height to it. It also has a bleaker colour scheme with only pale blue, white and brown whereas mine includes more vibrant colours. I think his colour scheme works better as it enhances the sense of deterioration and emptiness portrayed throughout the series. 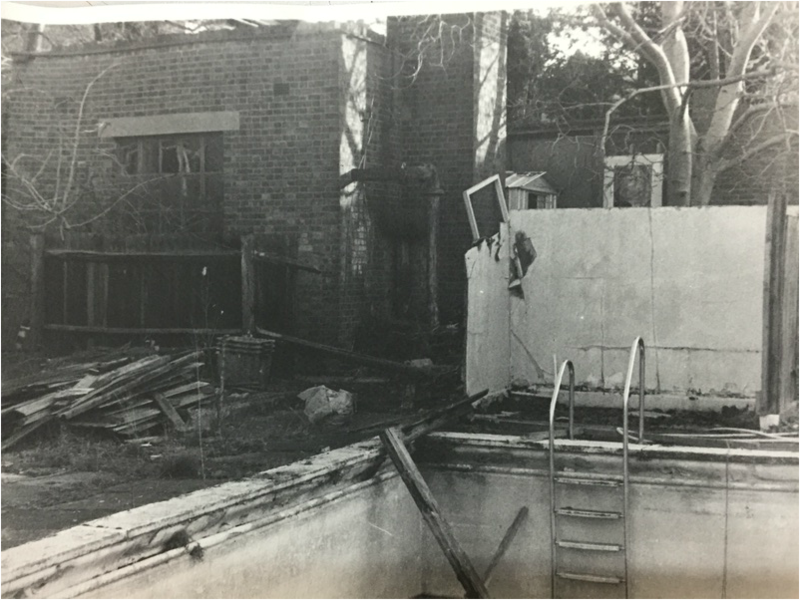 A week later, we returned to the derelict pool to take another set of observations on film cameras. When developing our images, we used different photo-paper (that felt almost like card) which was matte and had to be left to dry hanging up on a clothes line. This made the images curl slightly which produced a more rustic, decaying feel. I preferred this as it fit the theme of the image and contributed to the deterioration shown. 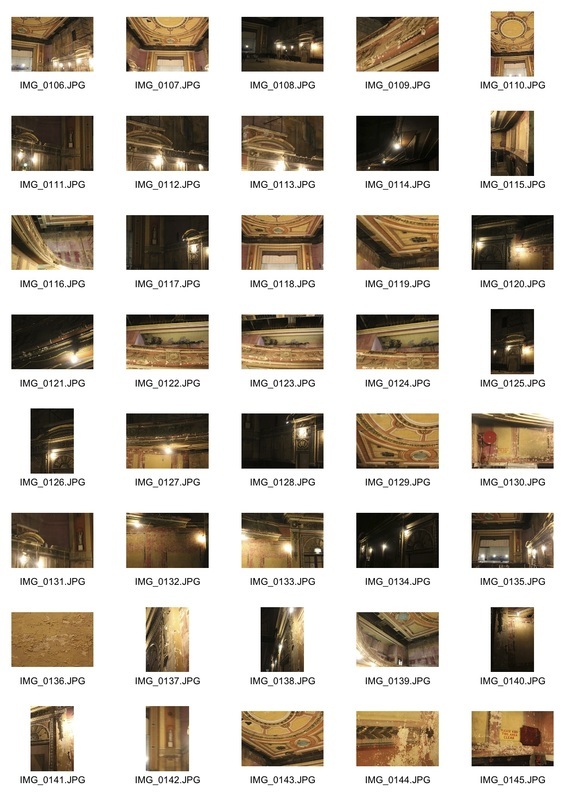 It also links more to Kander's work in which he uses film which adds to the deterioration pictured. The forgotten Victorian theatre in Alexandra palace was built in 1875, and has been derelict for 35 years. Originally designed by John Johnson, the theatre opened in 1875 and had a capacity for seating 2,500. The theatre has had an extremely chequered past; in addition to its theatrical uses it has served as a cinema, a centre for Belgian refugees, as part of a German internment camp and a BBC prop store. The peeling paint and old Victorian grandeur create a unique visual experience. We visited it and the adjacent palm courts on a trip. The aim of the trip was to capture this unique environment. The Blue Room from foto8 on Vimeo. ​Eugene Richards is an American photographer and writer. After gaining a degree in English, he studied photography. His latest work, The Blue Room, is a study in color of the abandoned, forgotten, but eerily beautiful houses of rural America. His work links to our trip to the derelict theatre in Ally Pally and the theme of abandonment explored in the pool and by Kander. Mise en Scene: this image consists of a dark landing in which cream/yellowing paint is peeling off of the walls and banister. The middle of the image depicts a whiter, frilly ad satin wedding dress which commands the viewers attention. Process: film, wide angle lens. ​Content: The photographer intended to portray the loneliness and isolation that often accompanied his 'Blue Room' images. He has done this by depicting a forgotten wedding dress, half draped across the floor. 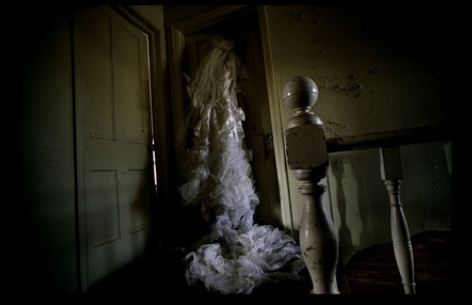 This evokes curiosity and ambiguity as to why the dress (clearly once of significance to it's owner) has been so casually discarded, or further, even if it was intentionally left in the dilapidated house. He could also be commenting on materialism and consumerism. This has been portrayed by juxtaposing the white silk and symbolic extravagance of a wedding dress with the tarnished, ageing walls. This contrast prompts further questions from the viewer about it's value: financially and sentimentally. Richards, by doing this, forces the viewer to consider the true value of such openly decadent objects by showing how it has been abandoned to 'rot' in the forgotten building. The image is composed at an odd angle, as if the photo was taken hastily without considering an aesthetically pleasing (or uniform) composition. This contributes to the idea that the inhabitant of the house/owner of the dress may have made a quick getaway and adds to the overall unease depicted. Mise en Scene: This photo shows a single bed (with just a rusted orangey mattress) in a small green room. There is a small mound of snow on the left side of the mattress, that has been blown in through the open window on the left. More snow is visible through it. Content: This particular photograph was made in Corinth, North Dakota. The photographer describes wandering around the town and going into this general store, which had probably been abandoned for 30 years. "You could just push your way into these places, which were all full of trash and broken windows. In the back I found this door, opened it, and inside was a bedroom." he had just discovered. He did this by composing the image well; the point of interest (the snow heap) lies on the intersection of each 'third' of the photo (rule of thirds). Despite having to work quickly in the sub-zero temperatures, Richards manages to portray a sense of stillness and quiet through this image. This has been done partially through the feeling of being undisturbed that is evident in the untouched blanket of snow and use soft, faded colours. This image also evokes a sense of ambiguity in the viewer and leaves them questioning as to why the room has been abandoned and left as it was for decades. 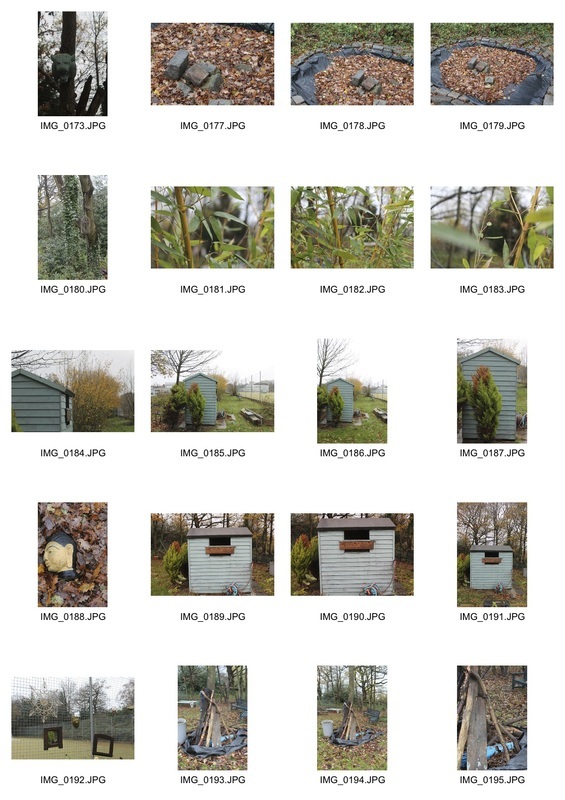 We visited the school allotment and tried to capture the environment. It used to be tended to regularly by a (now retired) teacher, but has not been used or up-kept in a few years now. It was interesting to see the extent to which nature had overcome the objects. This idea was further enhanced by the season coating everything in leaves. There were some odd objects and structures left there that prompted questions as to why and how they got there that were interesting to document. 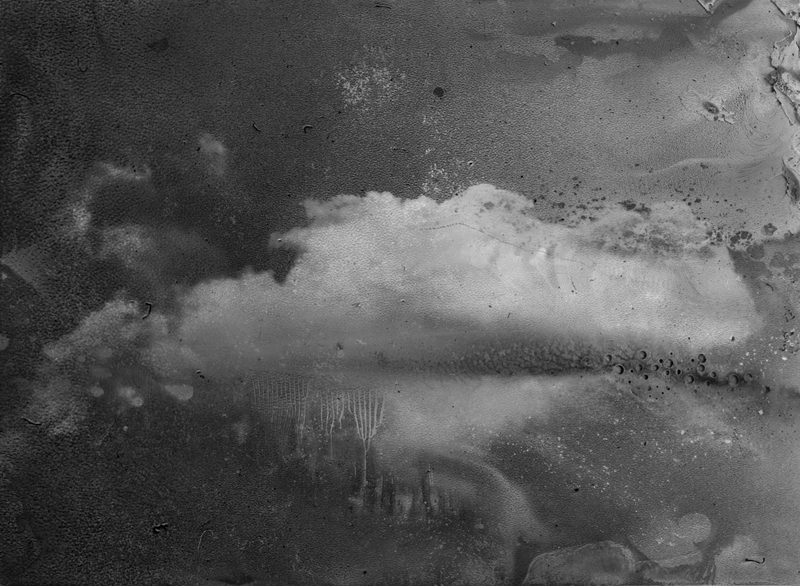 ​Daisuke Yokota is a Japanese photographer who experiments with different techniques in the darkroom. He was praised for “his meticulous approach to photographic experimentation, combined at times with visceral performances” and his willingness “to continuously test the limits of photography”. As a response to his work, I'm going to take a workshop in the darkroom and experiment with my prints in a similar fashion. I think this will create some visually intriguing images. 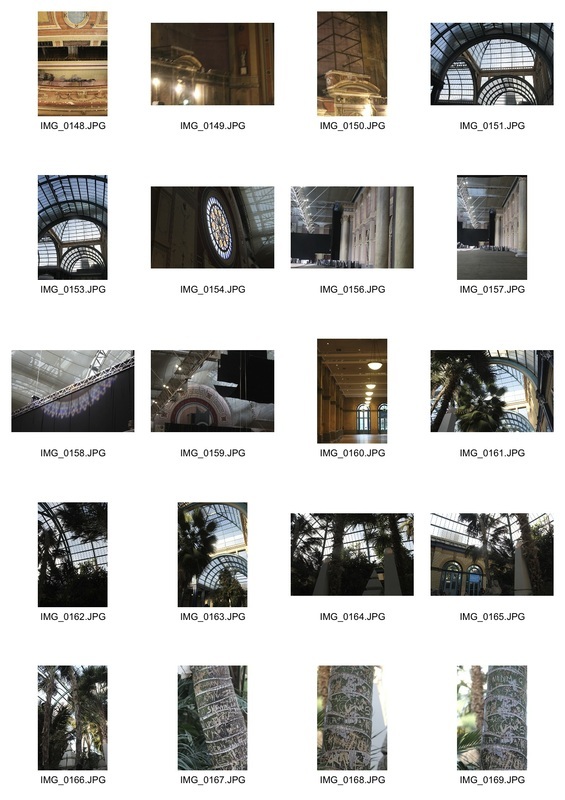 On our trip to Ally Pally, I also took some images on a film camera. I chose my favourite image and printed it in the darkroom. I then applied a variety of techniques to it to distort (and somewhat destroy) the images. 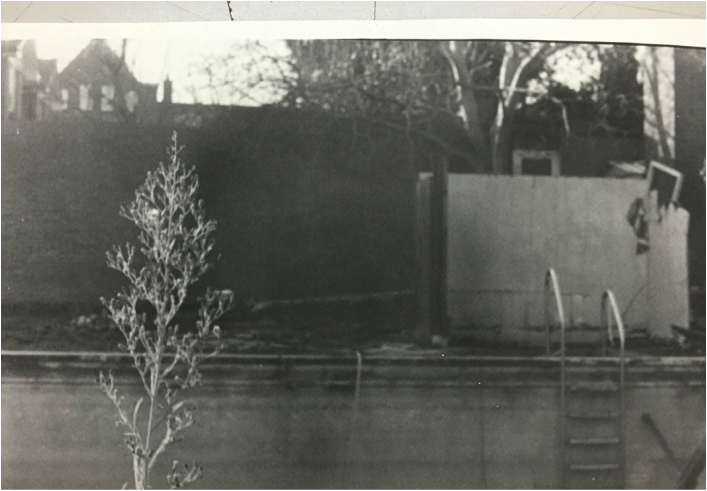 These included putting iron filings on a wet print to make it rust, spraying developer on the photographic paper (to expose some of the image) and putting bleach on developed images. This gave it a yellow, washed out feel. 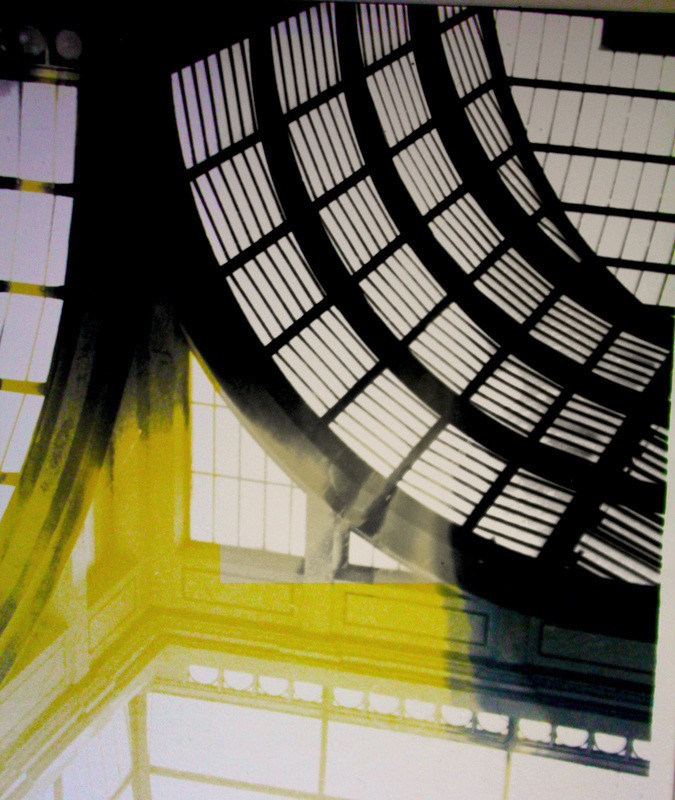 To experiment further, I took pictures of these prints and digitally altered them in photoshop. These edits included inverting the image, altering contrast and vibrance, adding translucent colour filters on top of the image, layering images on top of each other and cropping. 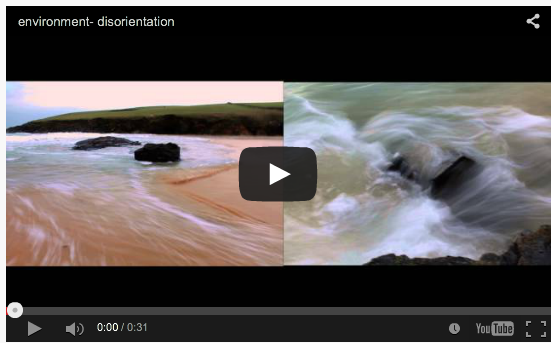 ​disorientation is a state of mental confusion as to time, place, or identity. 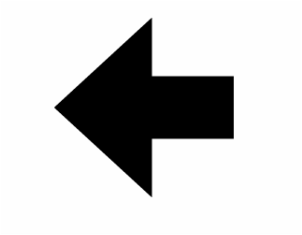 disorientation is a type of altered mental status. Orientation is knowledge of one's: personal identity. 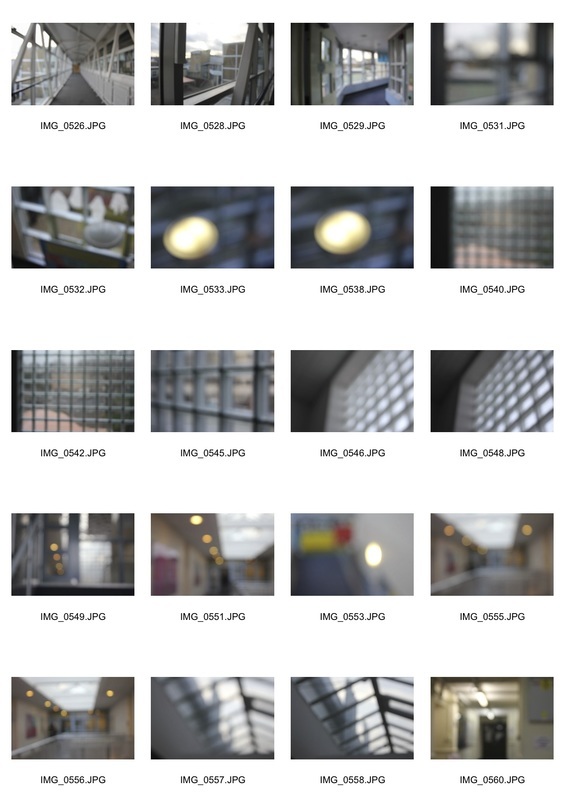 ​To develop my project further, I am going to photograph environments under the theme 'disorientation'. The photograph on the right is by Rolf Aamots. 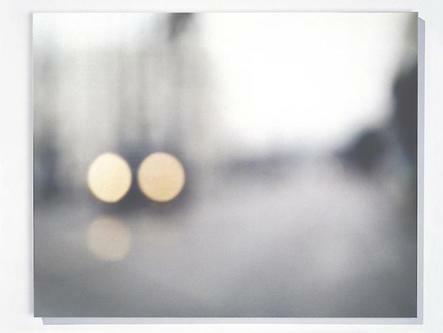 It fits the theme of disorientation as it's visually hazy and almost blurred. I liked the colours and how they dominate the image. As my first response to the theme of disorientation, I visited the Wellcome Collection gallery to go to the 'States of Mind' exhibition by Ann Veronica Jessens. The exhibition consisted of a room filled with coloured smoke that made it impossible to see more than 30cm in front of you. It was deliberately disorientating, and aimed to examine ideas around the nature of consciousness, and in particular what can happen when our typical conscious experience is interrupted, damaged or undermined. I edited the best images by altering the hue and adding coloured filters to some. This allowed me completely change the colour and mood of each image. 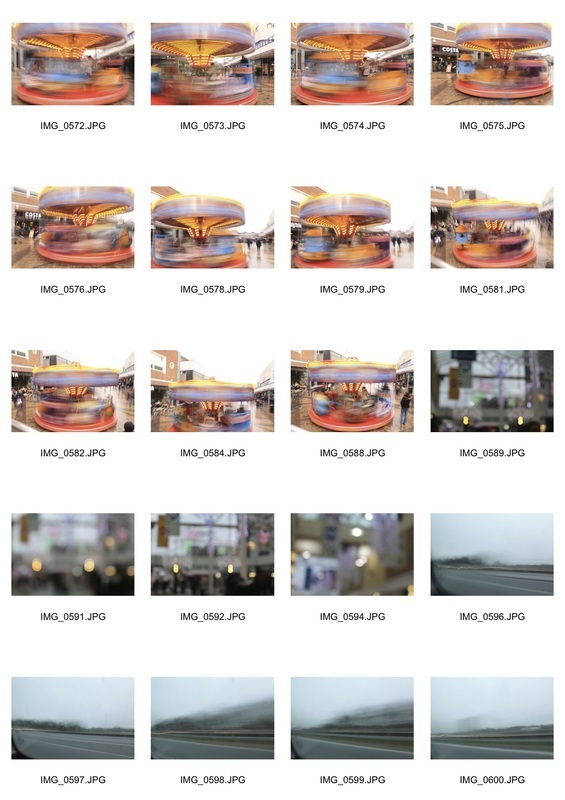 For my second set of observations, I chose to further explore the sense of blurriness/haziness that was captured in my first set (in the exhibition). The image on the left is by Ute Barth, who deliberately blurs her work. This evokes a feeling of being lost, or a sense that there is something just out of frame that the viewer tries to understand. This links to the theme of being disorientated- the blur makes the audience question what they are actually looking at. Another feature I liked within Barth's image was the perspective. Although heavily blurred, you can make out a focal point and horizon point that adds depth to it. 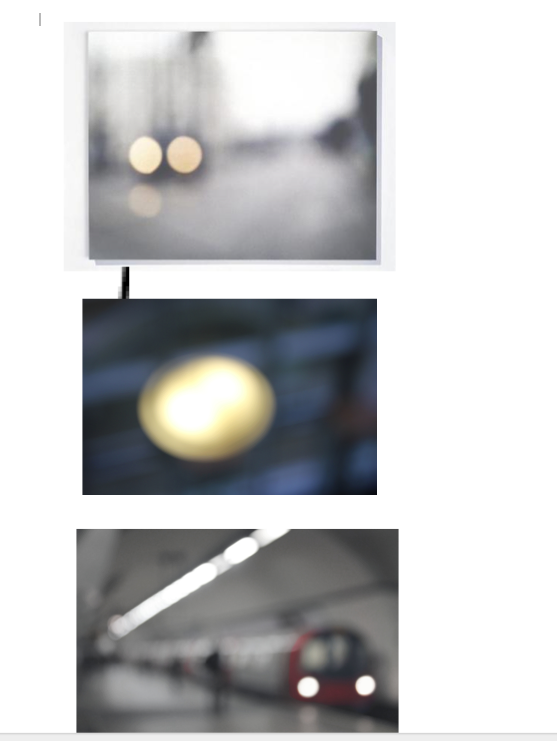 After experimenting with blur in my school environment, I went to take my next set of observations on the tube. I liked the sense of perspective created by the long tunnels/escalators. I edited my favourites to be washed out and brought out single, brighter colours as a focal point (like in Barth's images). Over the holidays I aim to photograph in London, Manchester and Cornwall. 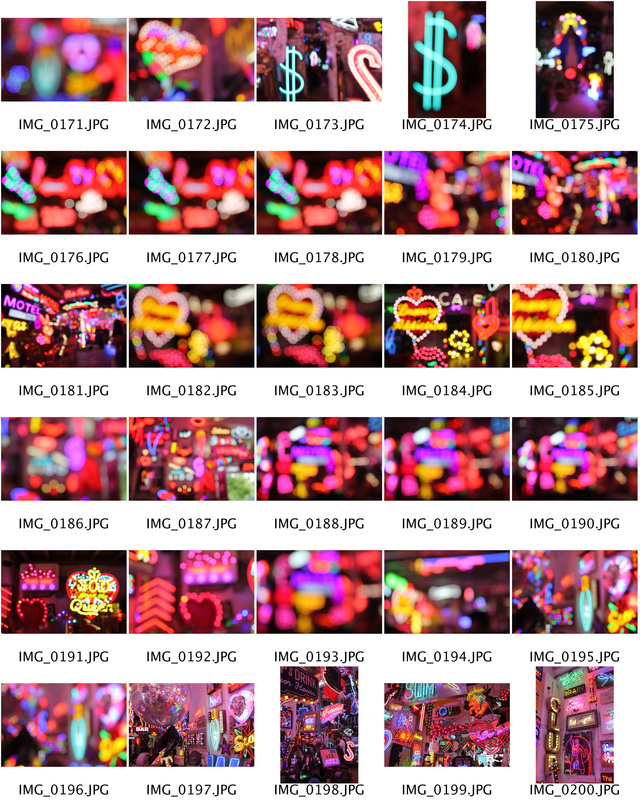 To develop this strand, I am going to photograph in the same style at night in roads. This will bring more colour and allow me to juxtapose it with the bleaker, emptier cornish landscape. In-keeping with the blurry disorientation theme, I'm going to take some above ground with long exposure to see the light trails. 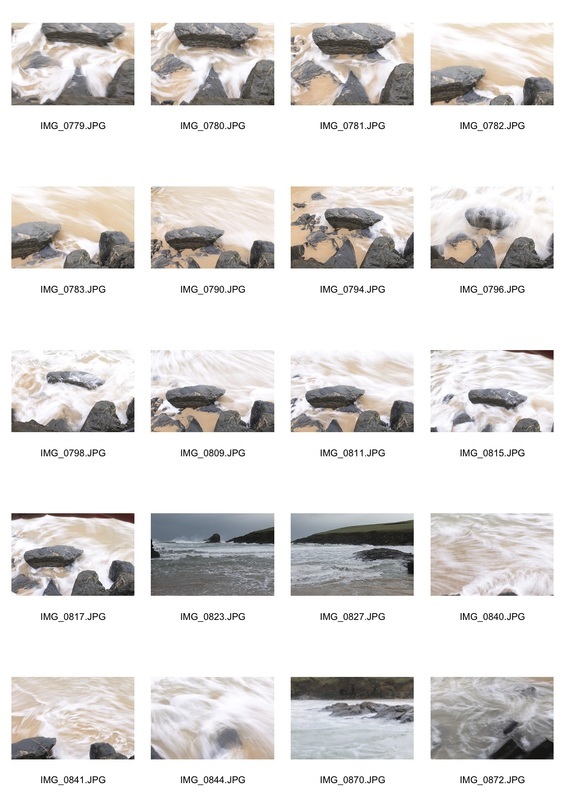 This will work well in Cornwall when photographing the sea and tidal movement. 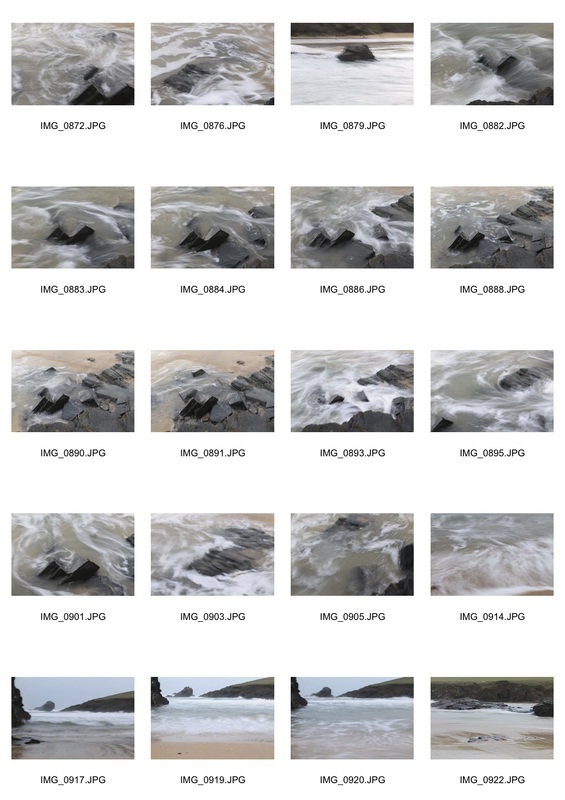 In this set of observations I tried to capture the moving water in the river Thames. This would create a blurred effect (in-keeping with my project) and link to the set I knew I would be taking later in Cornwall. However, it was difficult to accurately portray as the long exposure compromised the brightness and a balance of a shorter shutter speed had to be implemented (otherwise the image would be completely white). This meant that the water is only slightly blurred and the image still fairly light. When going to Cornwall, I'll take my tripod to stabalise the image and reduce blur in the components that I wanted to be still. 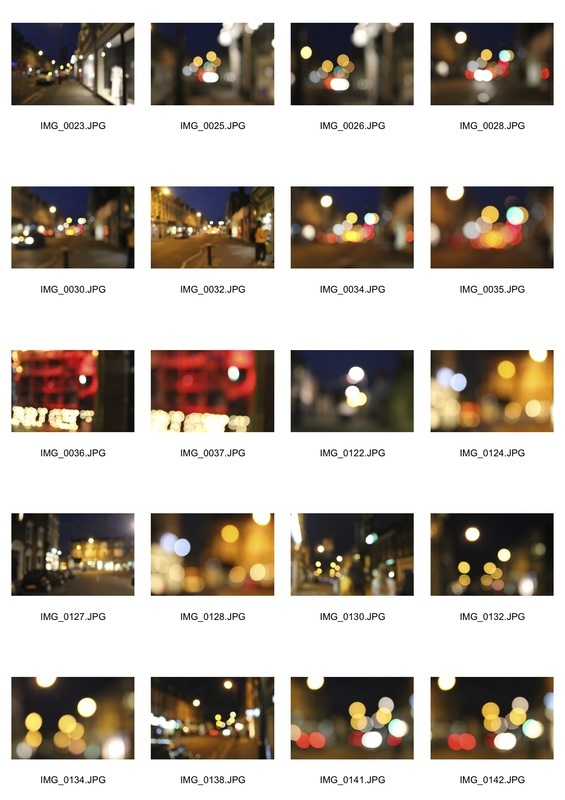 In Manchester, I photographed more city lights in the blurred style. The images turned out better than the London set as they provided a stronger colour contrast (as it was dark) and the colours became a lot brighter. I also took some long exposure pictures of a merry-go-round. I liked these as only the merry go round was in motion and blurred whereas the background was in focus. I edited some of the images in photoshop to change the colours and make them brighter. I felt this added to the disorientating feel of it. 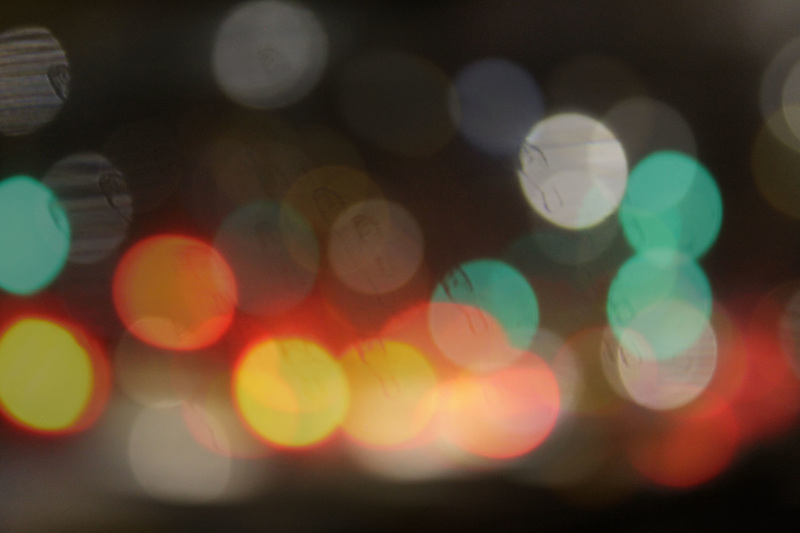 In Exeter I took more city light focussed images of blurred and blown up lights. This time, I tried to vary the extent to which the lights were out of focus (and therefore the size). 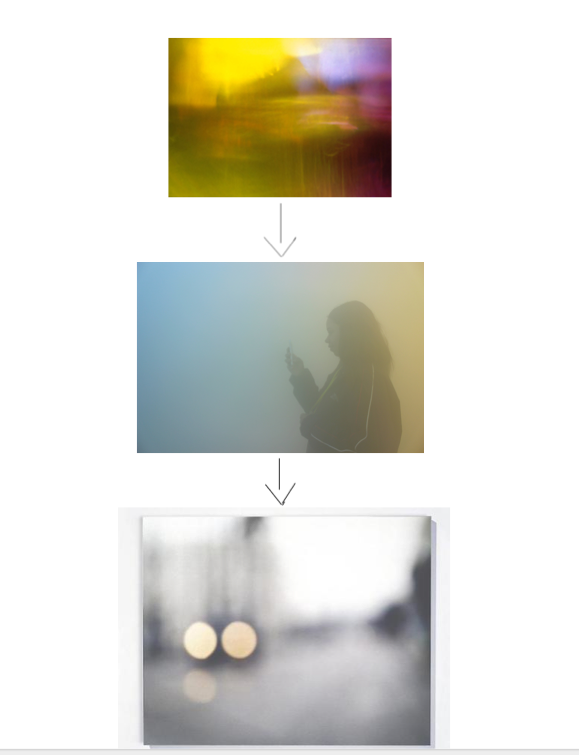 In the image on the right, I layered the images on top of each other and varied the opacity of each layer until happy. 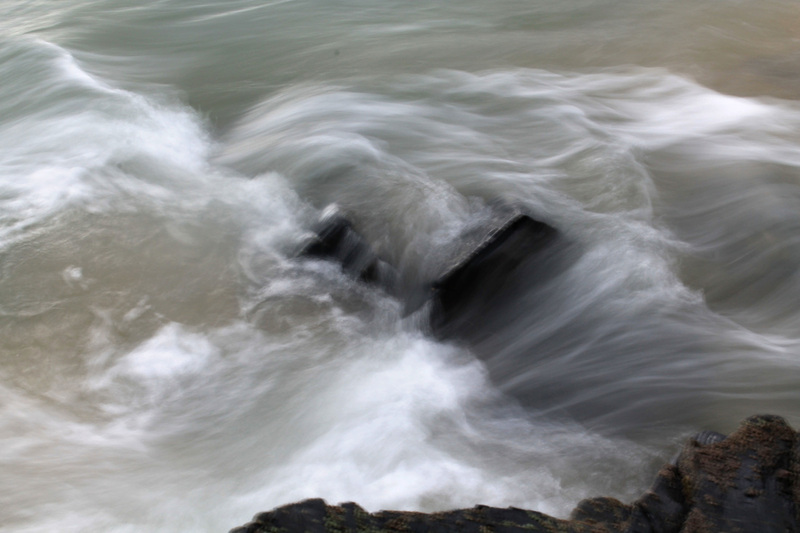 In cornwall, I took my tripod to the beach in attempt to capture the movement of the sea. This proved difficult as it was really bright and so keeping the shutter open for prolonged periods of time made the image white out. However, I am pleased with the outcome as I like how the sea is ever-moving and blurred in comparison to the surroundings. It's emptiness provides an interesting contrast with the busier city images. I decided to make GIFs of my different sets to bring them to life and develop my project further. This added to the disorientation as I tried to make it so that the focus was on the moving components. I did this by layering them in photoshop, changing the opacity and lining up key points in each image (e.g the rock in the first GIF) and then making the animation once they all lined up. This meant that it wasn't so jumpy and produced a more stable end result. It was interesting to see the difference in environments highlighted by the GIFs next to one another. 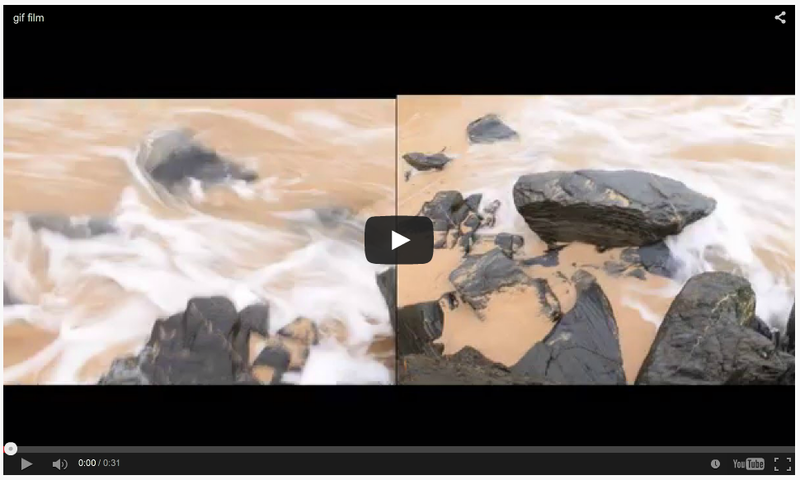 Premiere Pro Split Screen Effect from Robin Nichols on Vimeo. ​To develop my project, I want to put all the GIFs together in one piece. I also want to incorporate and emphesise the difference in environments. I'm going to try and make a split-screen project like the one on the left with GIFs instead of film footage. I am pleased with the result of the experimentation of putting my GIFs together into a split screen film as it unites the separate pieces and allows the viewer to see them alongside eachother and the different environments. However, I feel that the GIFs are too jumpy and fast to work well in this medium. 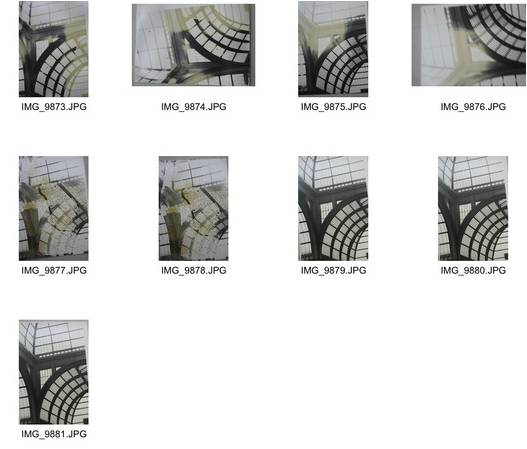 Moving forward, I am going to experiment with making a split screen film with stills for each GIF. 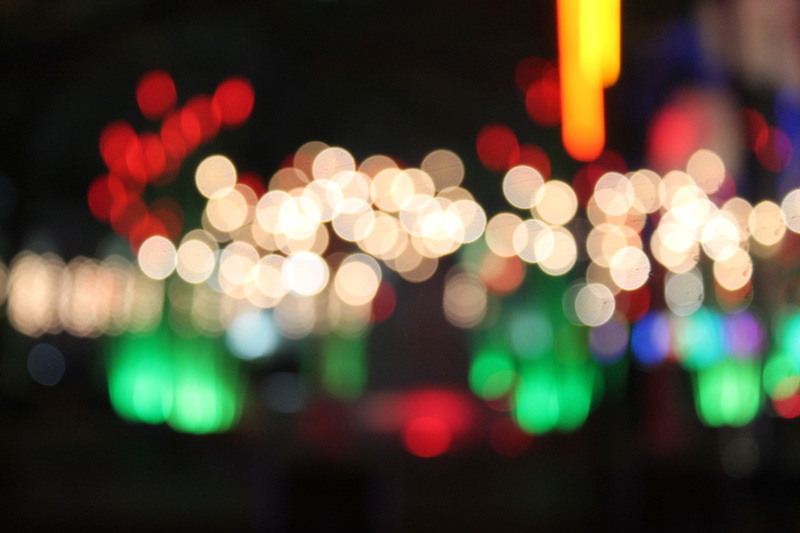 Mise en Scene: this image consists of many blurred yellow lights. 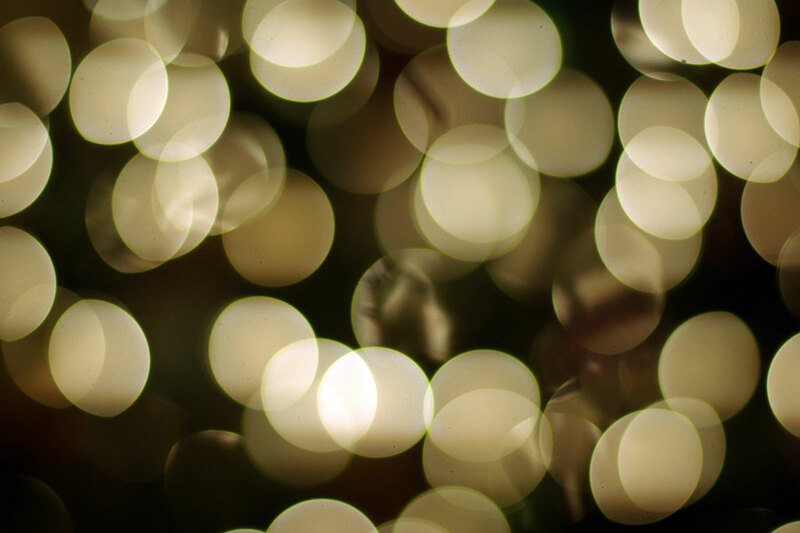 They appear as illuminated orbs and fill the whole frame, often overlapping. 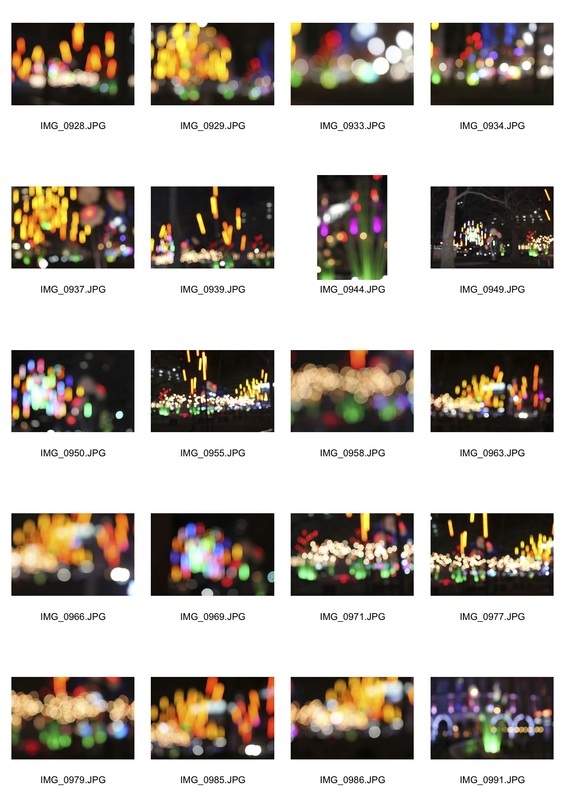 Content: The photographer intended to capture the festive (christmas) environment in an interesting and different manner: via the technique 'bokeh'. He did this by changing the settings on his camera and blurring out the christmas lights into unrecognisable spheres of light. This creates an almost magical sense and contributes to the festive context in which he took it. Seeram also intended to demonstrate a photographic technique that is both accessible and aesthetically pleasing to less experienced photographers. He did this by choosing a fairly simple technique of light photography that produces visually intriguing results. For my first response to Seeram, I went in to the dark room and used various torches and lights to create a similar effect. However, the images weren't that complex or interesting, so I edited them on photoshop by changing the colours of the lights and layering multiple images on top of eachother. 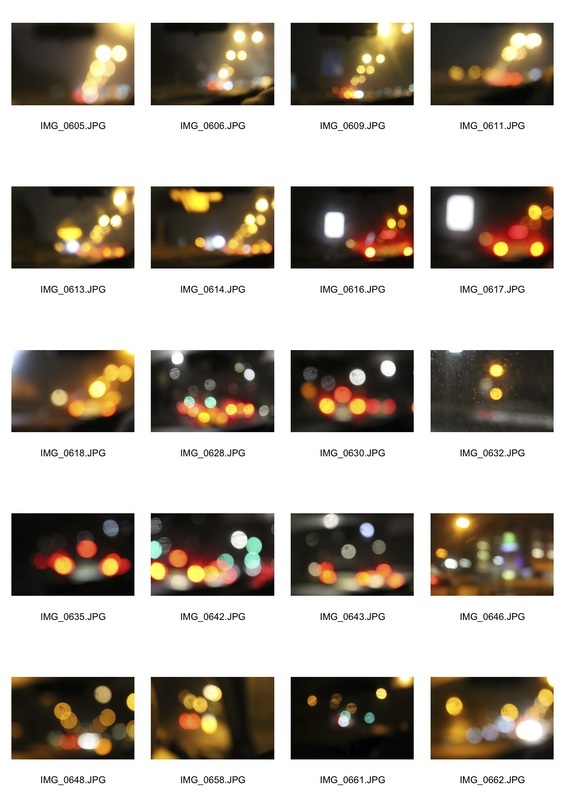 For my second response to Seeram, I took pictures of the street at night, focussing on blurring the lights. I feel these worked better than the previous set as there was more going on and more colour. 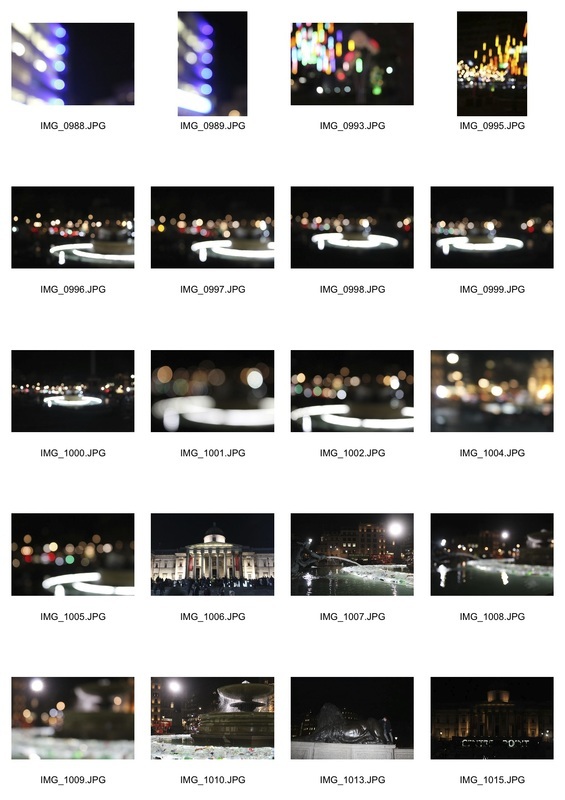 I also made a gif of the images to detail the extent to which the city lights had been blurred into abstraction. 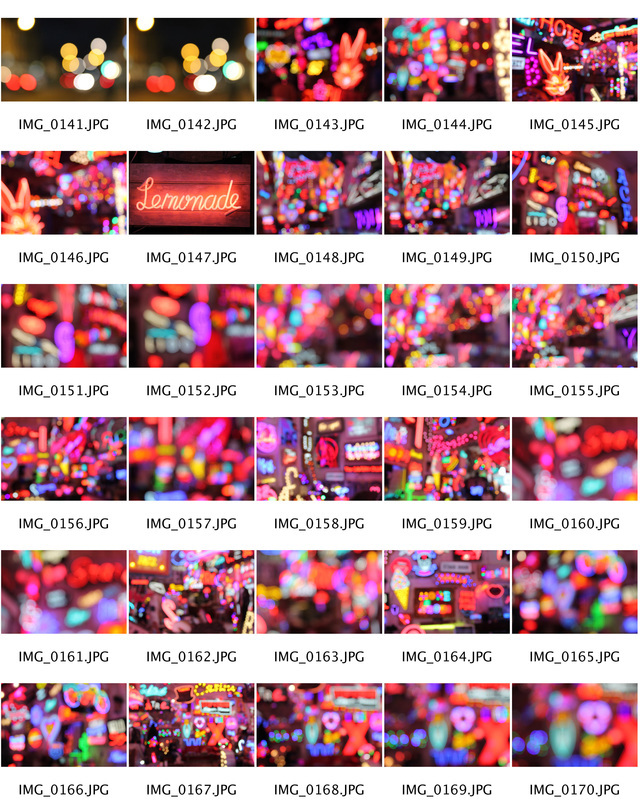 Continuing with my project, and drawing inspiration from the technique used by Seeram, I went to a light show in central London (Lumiere London) to take more city/light images. These worked out well as they were bright and visually interesting and contrasted with the dark sky. The range of lights and colour provided by the light show added further interest. step 4: change opacity to 0% to create another diamond, and move the diamonds according to when you want the images to fade in and out. ​The video on the right shows the outcome. 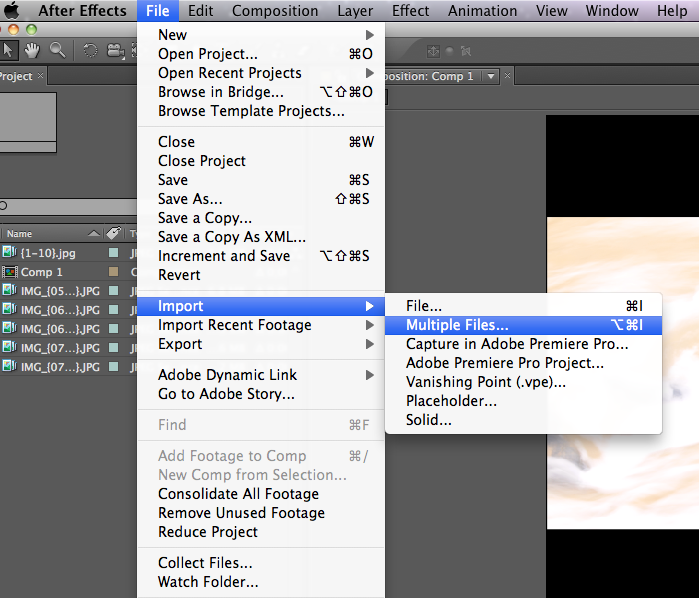 I then put the .mov file into iMovie and added audio. I chose to add the sound of traffic/city life as it would somewhat fit the light images and create a contrast with the seascape images. The background noise could also be mistaken for sounds of the sea so it works well.The final result is below. Although I originally intended for this film to be my final piece for the project, I don't think it is particularly effective. 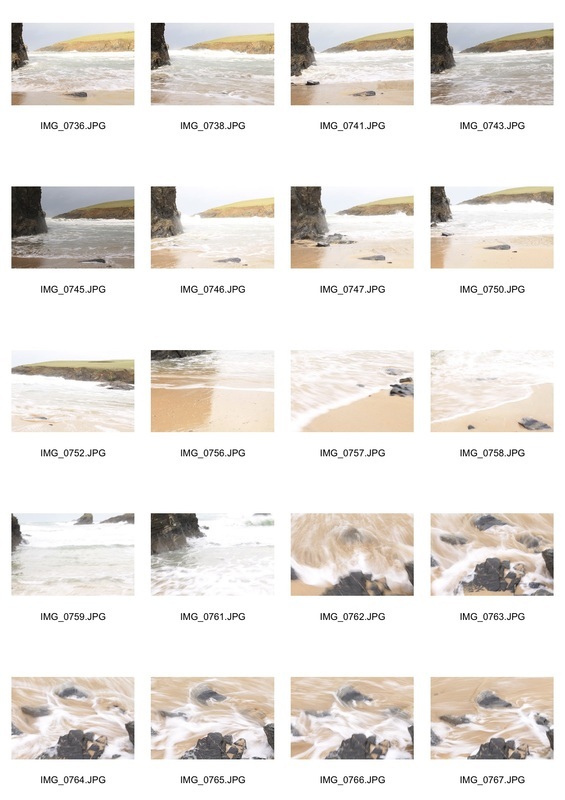 It almost looks like it could be a slow slideshow and doesn't reflect or represent the specific processes and programmes by which it was created. I also feel that the juxtaposition of the natural sea images and the city light images doesn't work as effectively as I'd hoped. Moving forward, I am going to focus on the 'lights' aspect of my project and develop this with further observations. For my next set after deciding against continuing the film outcome I had previously explored, I visited God's Own Junkyard in Walthamstow. This is an amazing warehouse full of neon lights, which is in-keeping with the strand I am pursuing; disorientation through the blur of lights. I used the same technique as I had done previously when photographing them; setting my camera on manual focus to blur the lights into abstraction, continuing the theme I had originally started with (disorientation). I'm happy with the resulting images as there is so much going on in them and the multitude of colours make them bright and aesthetically pleasing. I also like how the individual lights/signs are indistinguishable and they blur together to form a more abstract coloured mass. I chose my favourites to be the final images below. 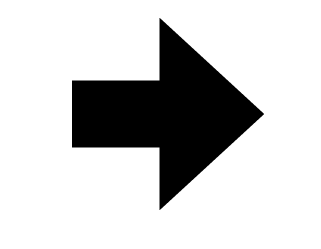 I am going to print these on to acetate in colour, and then window-mount them on a wooden structure and place a projector behind so that light floods through them. This will accentuate the coloured lights even more.